One of my all time favourite wines. Pegau is now firmly established amongst the leading lights of the AOC – one of Robert Parker’s favored estates that hasn’t exactly impeded their progress. But their rise to fame is really quite recent and coincided with Laurence Feraud joining her father Paul in the running of the estate in 1987 – the name of the estate dates from that year, “Pegau” being an old provencal name for a wine jug. There are 20ha of vines spread over 11 parcels – making life very complicated at harvest time but as each parcel has a unique terroir it adds considerably to the potential for complexity. The focus here is very much on reds – three cuvées are made – Cuvée Reservée (the tradition), Cuvée Laurence and in exceptional years Cuvée da Capo. All the wines are made in an uber traditional style: no de-stemming, no filtration, maturation in old (seriously old) oak foudres. The thinking behind the cuvée range is unique: the Résevée is aged 18 months before bottling, the Laurence is aged in the same type of old foudre for a further 18 months (so 36 months total) the vigneron effectively doing the job of cellaring for the consumer. The result is a rich gamey wine, very “old school” but with the potential to age for 10-20 years. In only exceptional vintages the special selection (from the best plots and the best barrels) Da Capo is made – a blockbuster of a wine – only around 6000 bottles are produced and collector interest has forced the price to one of the highest in the appellation, €250 per bottle. All the wines are very much Grenache based – an average of 85%. Laurence”s commercial success has allowed the estate to not only build a new cellar in 2010 but purchase an entirely new estate just outside the AOC boundary in the commune of Sorgues – 25ha of Cotes du Rhone Villages and Cotes du Rhone adding further (affordable) dimension to the Pegau range. These wines are marketed under the “Chateau Pegau” name to distinguish them from the Domaine wines. The court of the Avignon Popes attracted the first wave of Italian immigrants to Chateauneuf – a further wave of expert wood cutters, mainly from the Lombardy/Piedmont region, arrived in the C19th to clear forest areas in favor of vine. the current wine maker at Bois de Boursan Jean-Paul Versino’s grandfather was one of those woodcutters and he stayed on to make wine. This organic estate is morcellated across 27 plots of just 16.5ha – the terroir covers all the soil types of the AOC and all 13 grapes. Jean- Paul is a totally charming and passionate man who makes a fine ambassador for all things traditional in Chateauneuf. 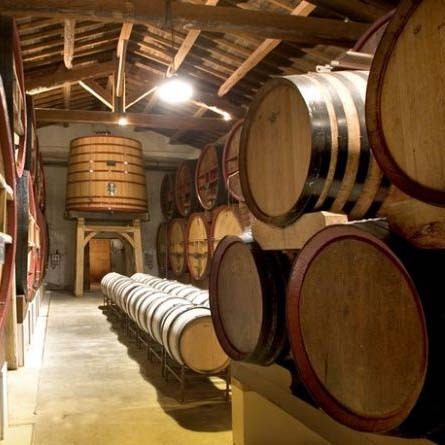 There is virtually no de-stemming and wines are matured in ancient oak foudres – originally beer barrels brought down from Belgium or Alsace, painstakingly deconstructed and erected anew in Jean Paul’s atmospheric underground cellar. Extraction levels are low and the grapes are pressed using an ancient basket press.There are two red cuvées: the Tradition – which is a GSM blend (65/15/15/others) and a top cuvée “Cuvée des Felix”, made from 90 year old + vines and with a very low yield of 20hl per hectare. The blends are aged in the foudres for two years. The Versino style is traditional, big but not forced with layers of garrigue and spice around the fruit – delicious when mature f you have the patience to cellar. The white is a tiny production – just 5% – from Clairette, Grenache Blanc, Roussanne and Bourboulenc, 20% is aged in small new oak barrels and 80% in the vat for 6 months. The style of the white is on the leaner, fresh, citrus fruit side, more apero suited perhaps than food. Jean-Paul’s wines are not only remarkably good quality they are also some of the best priced in the AOC – they are in short a steal. One potentially confusing aspect – the wines are marketed sometimes under the Bois de Boursan label, sometimes under simply Versino. Sabon is a modest-sized estate – just 17 hectares – but with a big reputation. The estate started bottling its own wines in 1921 though sanons have owned land in the area sine the early C16th – the family at that time split into three important wine making lines (Mont Olivet/Chante Cigale/and Roger Sabon). Today its the son in law of Jean-Jaques Sabon – Didier Negron who is principal wine maker – Didier trained at La Nerthe and La Gardine. Always entertaining – with a pov on everything CNP- Didier is our host for Sabon visits. The domaine produces 4 red wines all based on a high Grenache percentage: Les Olivets, Réserve, Prestige, and the luxury cuvée Secret de Sabon. Sabon were in the vanguard of introducing “special cuvées” in the early 80’s, now the norm for the vast majority of CNP estates. The style at Sabon, could be characterized as semi-modern in that most grapes are destemmed – however elévage is mostly in foudre and demi-muids (600l barrels) with only a small percentage in barrique and no new oak employed. In great vintages the Prestige is a favourite of mine -I have treasured memories of the 2005. The Secret de Sabon is produced from more than 100 year old vines with a yield below 20 hl/ha. It’s matured for 12 months in demi-muids, but as the name says, other facts about the wine are a secret of the family. Only about 2.000 bottles are made in good vintages and it’s one of the most expensive wines from the appellation. In addition to their CNP business Sabon offer a range of wines from their land holding outside the AOC – in the aocs of Lirac, Cotes du Rhone and Vin de France; these latter wines can offer tremendous every day drinking value. This is one of the oldest estates of the Chateauneuf du Pape appellation and in the top 6 in terms of production, yet has kept a low profile. In the last century Nalys was famous for being run by Chateauneuf’s favourite doctor – Dr. Phillip Dufays – who when not tending to his patients built a reputation as one of the great modernisers. Up to his death in 1978 he led the move towards carbonic maceration vinification – a technique which softens tannins and produces a relatively lighter fruity wine approachable very shortly after bottling. A bust of Dufays is the first thing you see as you approach the tasting room. Today Nalys is owned – like many great Bordeaux estates – by the insurance company Groupama which might not bode well but my tastings confirm that the tradition of experimentation and quality control is alive and kicking under the new management. The estate comprises about 50 hectares on three parcels of land. They continue to cultivate all 13 grape varieties permitted by the AOC and regularly test different blends; the cave contains an amazing variety of maturation vessels from concrete tank through different sizes of wood: demi-muid, foudre, barrique to an ultra trendy unlined concrete egg – a bizarre looking experiment, Nalys owns part of the famous La Crau plateau – familiar to many from the label of Vieux Telegraph. Huge rust galets surround 50 year + Grenache vines – this is as dramatic a landscape as you could hope to find in the region. On a fine day you can enjoy not just the sight of these majestic, tangled vines but spectacular views west to Mt. Ventoux, south to the Palais du Papes at Avignon and east to the village of Chateaneuf. The range of wines is simple at present : a classic cuvee red, the 2004 and 2005, and in white three vintages 2004 to 2006. Around 20% of production is given over to whites way above the appellation average and Nalys whites have always enjoyed a special reputation. The whites are elegant showing greater complexity with bottle-age – notes of white flowers, candied orange peel and citrus with a pleasing glycerol fatness. Unlike some other whites from this appellation – of equal standing – these achieve a subtle richness without resorting to overt use of oak. Nalys reds are round, generous and fruity with a touch more licorice and spice in the 2004 – the tannins are ripe and soft . . . these are wines that can be appreciated when young. STOP PRESS: In 2017 Nalys was purchased lock stock and barrel by the Guigal family - its early days to assess the impact but given the potential of the terroir at Nalys, and Guigal’s deep pockets for investment, the fortune of this historic estate is bound to be in the ascendancy. Le Clos du Caillou is a Chateauneuf du Pape estate that captured a lot of wine press headlines in 2007 for their superb CNduP and Cotes du Rhone. Sylvie Vacheron manages this fascinating estate with the help of her oenologist Bruno Gaspard, following the tragic accidental death of her partner Jean-Denis in 2002. The estate of 53 hectares is located just to the east of Courthezon on the very (north east) border of the CduP appellation boundary. In fact the property itself and a large part of the estate is in Cotes du Rhone AOC – though as Sylvie explains the demarcation line separates by a few metres identical vines, identical assemblage, and no doubt the same fastidious attention in the winery – the consequence of which is that the Cotes du Rhone range here is only a whisker away from the quality levels of the Chateauneuf du Pape and at around half the cellar door price represents tremendous value for money. The terroir here is either sand or red galets – wines produced from the latter parcels, whether CduP or Cotes du Rhone, are branded Quartz. Caillou is very much about reds – less than 1 hectare is given over to whites. The range comprises an entry level Cotes du Rhone from 90% Grenache, a “Bouquet des Garrigues”” Cotes du Rhone from 50 years + old vines and 85% Grenache, “Les Safre”” a special cuvee Cote du Rhone from sandy parcels of land, a special Cotes du Rhone cuvee Les Quartz from the galet strewn oldest part of the domaine, and then the two Chateauneuf du Pape cuvees, the traditional regular cuvee and the premium Quartz. The latter is again Grenache dominant, receives a 33 day fermentation in wooden cuves, maturation is in foudre and large wooden cuves for 12 months. The Syrah component is matured in new barriques for a full 18 months. Jancis Robinson’s assessment of the 2004: “The red Quartz bottling positively vibrates with minerality and shows great intensity”. The 2004 bottling of Quartz was awarded 5 stars . . . one of only 3 in a tasting of several hundred CNduP . . . in the December 2007 Decanter magazine tasting. This is a hugely impressive range of wines from a passionate and dedicated team and one that due to the geographical layout of the estate, affords wine lovers remarkably high quality at price points from just 6.5 euros through to 71 euros! This estate exudes history and could be considered the most attractive showpiece for the entire Southern Rhone – on a par with the great chateaus of the Medoc. La Nerthe has been making wine since the 16th century and its cellars which we can visit are the oldest in the region: the poet Frederick Mistral called the wine of La Nerthe “un vin royal imperial et pontifical”; during the second world war the luftwaffe (always on the look out for a bit of luxury) chose La Nerthe as its occupation base. But given all this history and its natural good looks – the 18th. century chateau is breathtakingly beautiful- it might just be that the wines themselves are mediocre. Not so. Under the skilled management of perfectionist Alain Dugas, La Nerthe is in the front rank of the appellation. The 90 hectare estate is situated to the south of the village on the road to Sorgue/Avignon on some of the rockiest terroir in the region. There are many old vines..the average age is 40 years and since 2000 has held full organic certification. The range comprises a traditional red, which represents 77 of the 90 hectares (normally 55% Grenache, 17% Syrah, 15% Mourvedre, 7% Cinsault, 3% Counoise, 3% others), a white (from 32% Grenache blanc, 30% Roussanne, 22% Bourboulenc and 16% Clairette). There are in addition two premium cuvees available, in red the Cuvee des Cadettes which has more Mouvedre and the white Clos de Beauvenir based on 60% Roussanne. The latter is a sumptuous tropical fruit laden wine with complexity and length the match of many a fine burgundy. The Cuvee des Cadettes is regarded as one of the appellations most prestigious wines: the colour is deep and rich, with intense aromas of blackberry, blueberry and wood spice, tannins are huge but integrated and the wine has an astonishingly long finish. Robert Parker awarded the 2004 Cuvee des Cadettes 92-95 points in his recent summary of Rhone wines. La Nerthe is not just a showpiece it is an estate at the top of its game. A domaine dear to my heart - one of the first in my tour network - and one we now feel very “attached” to as minor shareholders in their GFV vineyard expansion scheme - I believe Jude and I own about 12 Solitude vines! 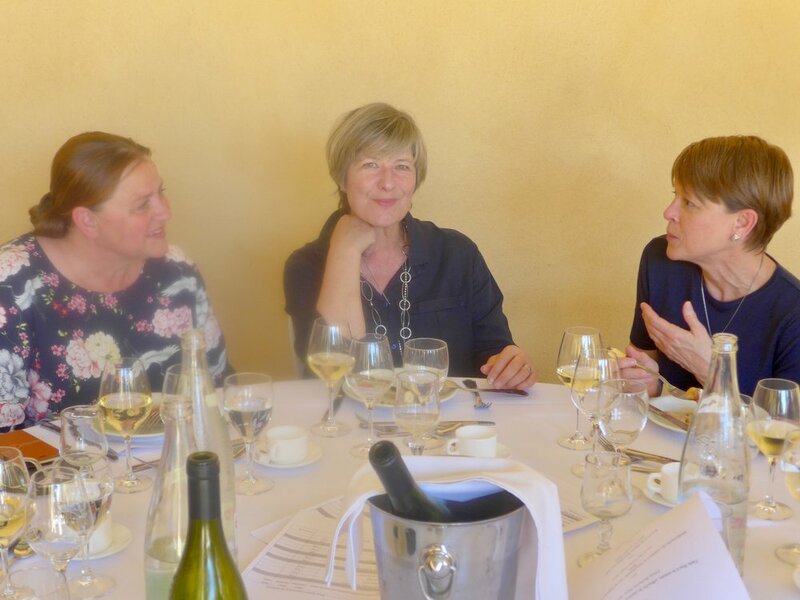 But it allows is to vote at the AGM , pick up our annual premium in great wines and moreover take part in a fabulous shareholders post AGM slap up lunch with magnums of their very best on the table. Solitude is an estate with real heritage - the ancestors of current owners the Lancons were the Italian Barberinis who settled in the area in the 13th century ( Barberinis counted a Pope and two Cardinals amongst their clan). Todays estate amounts to 38ha, so mid sized, and shows its heritage in part because the vines are neatly situated around the property instead of being morcelated as is the case for most domaines in the appellation. Soils are a mix of classic gallé roulées on a clay sub soil and sand. The latest generation wine maker is Florent Lancon and he is definitely showing his mark with a move toward more elegant wines with less extraction, less oak influence. As well as a classic red CNP and white CNP (always a treat) there are now 5 special cuvées, the more concentrated red/white “Cuvée Barberini” , a superb restrained style 100% Grenache “Cornelia Constanza” from many terroir ( one of my go to wines for any special occasion) , the haut de game “Réserve Secret” a super dense almost port like CNP ( awarded 100 Parker points in some vintages) and a more recent heritage special cuvée “Vin de ls Solitude” which re-creates the blend ( a very unusual 30% of the rare Counoise varietal leads th) and style of the wines made at the estate in the 18th century. Florent’s laid back charm, the outstanding quality of the range and the magnificent VIP tasting room adorned with oil paintings of the family’ ancestors makes Solitude a very special visit. Domaine Cristia is always an exciting visit - always something new from the dynamic brother/sister team Baptiste and Dominique Grangeon- ably assisted by cousin Emannuel Brunier. The domaine was started by their grand father Etienne in 1942 and has now expanded to some 50 + hectares of which 14 are in CNP. The location of the vines is, like so many CNP domaines, morcelated across the appellation with a variety of terroirs including classic clay and also sandy soils. The name “Cristia” itself relates to a Lieu-Dit, a neighbouring plot to the famous Rayas. Cristia has recentled moved to bio-dynamic status. The location of the vinification and tasting caveau is located in the village of Courthézon - they are a neighbour of Janasse. The style here is polished, robust, tending with the top cuvées towards a more international style but maintaining local integrity. The two special cuvées Vielles Vignes ( 100% Grenache) and Renaissance ( 60% Grenache/40% Mourvedre) are first class in most vintages and have been awarded stellar marks by the critics. I opened a 2010 Renaissance magnum on my last birthday to share with friends and it was sensational. In addition to the CNP range , the two aforementioned top cuvées and a very sound classic red CNP and delicious white CNP made in very small quantities ( just 1 ha) Cristia have a thriving business in Cotes du Rhone/Cotes du Rhone Villages and IGP ( more than 35 Ha) - what I sometimes refer to as “over the motorway” wines ( the A7 artificially separating them from CNP status)- great value drinking to be found here - especially in my view the Cotes du Rhone Vielles Vignes 100% Grenache. A stop at Mont Thabor has to be one of the real treats of a tour day at Chateauneuf du Pape- Mont Thabor is about as artisanal as it gets in this region- the wine maker Daniel Stehelin is a one man band winemaker , with just occasional helped from daughter Fanny. The location is hidden away in the village of Bédarrides on the south east perimeter of the appellation - a winery so discreet it took me the best part of a morning to find - owner, being on this own , doesn’t particularly welcome drop-ins so there is zero signage to help you. But once discovered what a gorgeous place this is - Daniel’s ancestors came from Switzerland in 1881 and purchased the property which was being run as an auberge/staging post on the N7 main route for Lyon to Marseille. The vinification today takes place in what were the old stables of the auberge. This is almost garage style winemaking - never more than 10,000 bottles produced - on just 4ha of CNP ( well placed terroir adjacent la Nerthe) and on the Courtézon side of the N7 a further 6ha of Cotes du Rhone. No white CNP, just a classic red - a wonderful characterful old fashioned rustic style ( 2015/16 were wonderful examples) and a Cotes du Rhone red which can be exceptional value at €8 a bottle. In a bountiful year a white Cote du Rhone is also produced - usually just one barrique sized barrel - and as Daniel explains the quantity is so small its not worth starting up the press so either he or Fanny foot presses! Love this place.